Friday July 7th – Thursday July 13th! The Gardener – Held Over for a 2nd Week! A documentary about Frank Cabot’s Les Quatre Vents, aka Cabot Garden, a magnificent private garden in the Charlevoix region near Quebec City. 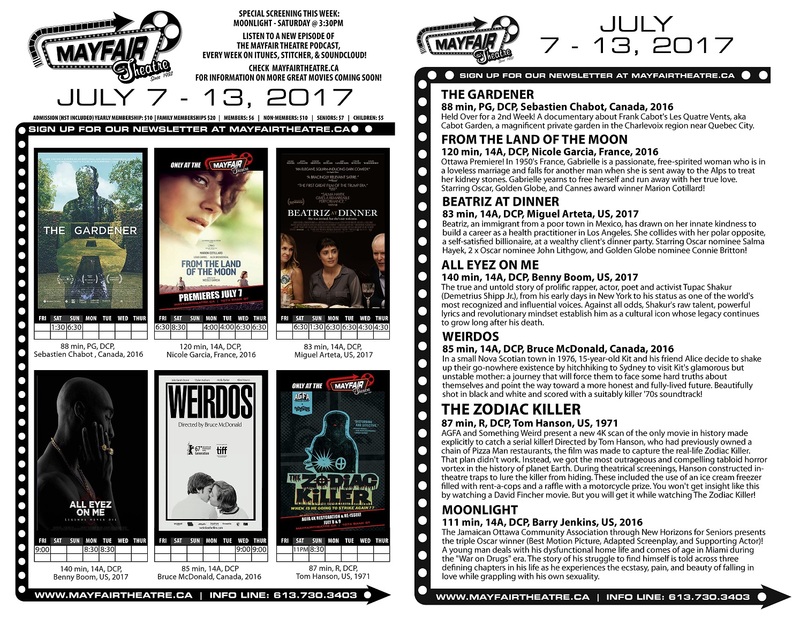 From The Land Of The Moon – Ottawa Premiere! Gabrielle is a free-spirited woman in a loveless marriage who falls for another man when she is sent to the Alps to treat an illness. She yearns to free herself and run away with her true love. Beatriz At Dinner – Beatriz, an immigrant from Mexico, has drawn on her kindness to build a career as a health practitioner in LA. She collides with her polar opposite, a self-satisfied billionaire, at a wealthy client’s dinner party. All Eyez On Me – The true story of prolific rapper, actor, and activist Tupac Shakur, from his early days in New York, to his status as one of the world’s most influential voices. A cultural icon whose legacy continues to grow long after his death. Weirdos – In a small Nova Scotian town in 1976, 15-year-old Kit and his friend Alice decide to shake up their go-nowhere existence by hitchhiking to Sydney to visit Kit’s glamorous but unstable mother. The Zodiac Killer – AGFA presents the only movie ever made to catch a killer! The film was made to capture the real-life Zodiac Killer. That plan didn’t work. Instead, we got the most outrageous tabloid horror vortex in the history of planet Earth. Moonlight – The Jamaican Ottawa Community Association through New Horizons for Seniors presents the triple Oscar winner about three chapters about a young man dealing with his dysfunctional home life and coming of age in Miami.